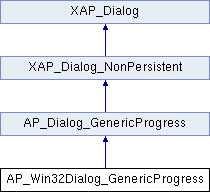 References XAP_Win32DialogHelper::centerDialog(), DELETEP, AP_Dialog_GenericProgress::getInformation(), AP_Dialog_GenericProgress::getTitle(), m_hInstance, m_hProgress, m_hWnd, m_pWin32Dialog, XAP_Win32DialogHelper::setDialogTitle(), and UT_return_val_if_fail. References AP_Dialog_GenericProgress::a_CANCEL, AP_Dialog_GenericProgress::m_answer, m_hWnd, UT_DEBUGMSG, and UT_return_if_fail. References XAP_Frame::getFrameImpl(), AP_Dialog_GenericProgress::m_answer, m_hInstance, s_dlgProc(), this, UT_DEBUGMSG, and UT_return_if_fail. References m_hProgress, UT_DEBUGMSG, and UT_return_if_fail. Referenced by _onInitDialog(), AP_Win32Dialog_GenericProgress(), and runModal(). Referenced by _onInitDialog(), and setProgress(). Referenced by _onInitDialog(), and close().